Dell’s stock price shot up more than 15% a few hours ago after a report by Bloomberg claimed the company was in buyout talks with at least two private equity firms. Citing "two people with knowledge of the matter", the report says Dell has already contacted a number of large banks to help finance the move, noting that the discussions are preliminary and could fall apart if financing isn't secured or an exit strategy isn't agreed upon. Dell has long been one of the world's top three largest PC makers, but as several others in the business, they've been struggling lately in the face of changing market dynamics and ever decreasing margins. 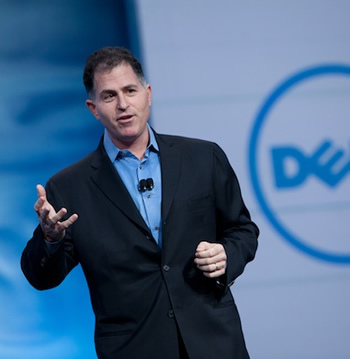 According to recent data from Gartner, Dell’s worldwide PC sales slowed by about 20 percent in the fourth quarter, as the company continued to lose ground to HP and Lenovo. Dell's stock value has lost about a third of its value over the past year. Overall the company is still turning a profit quarter after quarter, but as the consumer division continues its dramatic slide, the focus has increasingly shifted to providing business products like networking and storage to stave off loses. Since CEO Michael Dell owns a sizeable15.7 percent of the company's shares, Bloomberg's sources say that is easier for financial firms to work out the deal and take his computer company private. The irony is not lost on Bloomberg's BusinessWeek, which notes that during Dell’s glory days and Apple’s darkest hour, Michael Dell infamously suggested Apple should go private and return the money to shareholders. Of course, the latter went on to pull off one of the biggest comebacks in corporate history.